September is a good time to get your cholesterol checked and take steps to get it under control. Cholesterol is a type of fat found in blood and is found in foods we eat including eggs, meats, fish and whole-fat dairy products. Foods like fruits, vegetables and whole grains contain none. Our body also makes cholesterol. Risk factors that can lead to high cholesterol include being overweight/obese, poor eating habits, family history, age or gender. 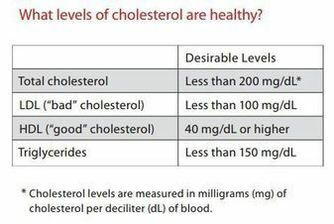 U.S. CDC recommends that adults age 20 or older have their cholesterol checked every five years. This can be done with a simple blood test. Eating a healthy diet. Avoid saturated fats and trans fats. Polyunsaturated fats can actually lower cholesterol levels. Eating fiber also can help lower cholesterol. Exercising regularly. The Surgeon General recommends that adults engage in moderate-intensity exercise for two hours and 30 minutes every week.